Ever since Myanmar undertook a series of political, economic and administrative reforms in 2011, the country’s economy has steadily improved. According to data from the Asian Development Bank (ADB), Myanmar is enjoying some of the highest growth rates in the region. The ADB predicts that the country’s gross domestic product (GDP) will grow by eight percent, higher than any other country in Southeast Asia. Similar to other Southeast Asian nations at the moment, Myanmar is also pushing for an upgrade on its infrastructure. One of the main infrastructure projects underway is the upgrading of the Yangon Circular Railway. Myanmar is also developing three Special Economic Zones to increase foreign direct investment into the country. With major plans for the future, Myanmar’s energy demands are expected to grow concurrently with its development. According to the Ministry of Electricity and Energy, energy demand is expected to increase at 15 percent annually, double that of the forecasted economic growth. Meanwhile, the Japanese International Co-operation Agency (JICA) – Myanmar’s largest source of official development assistance (ODA) – is expecting demand for electricity to multiply fivefold to 15 gigawatts (GW) by 2030. At the start of the year, the government of Myanmar announced that it will begin importing liquefied natural gas (LNG) to help meet the growing energy demands of the country. The government has stated that there are three LNG projects in the pipeline. The proposed LNG plants are located in Kanbauk in Tanintharyi Region, Mee Laung Gyaing in Ayeyarwady Region and Ahlone in Yangon Region. The government is hoping that half of these projects will be operational by mid-2020. These powerplants, in addition to the natural gas project in Kyaukphyu in Rakhine state is expected to raise Myanmar’s electricity generation capacity by 3,100 megawatts (MW). With the construction of these plants, the total electricity generated in Myanmar is set to go up to 6,000 MW, double from the current 3,000 MW being generated. 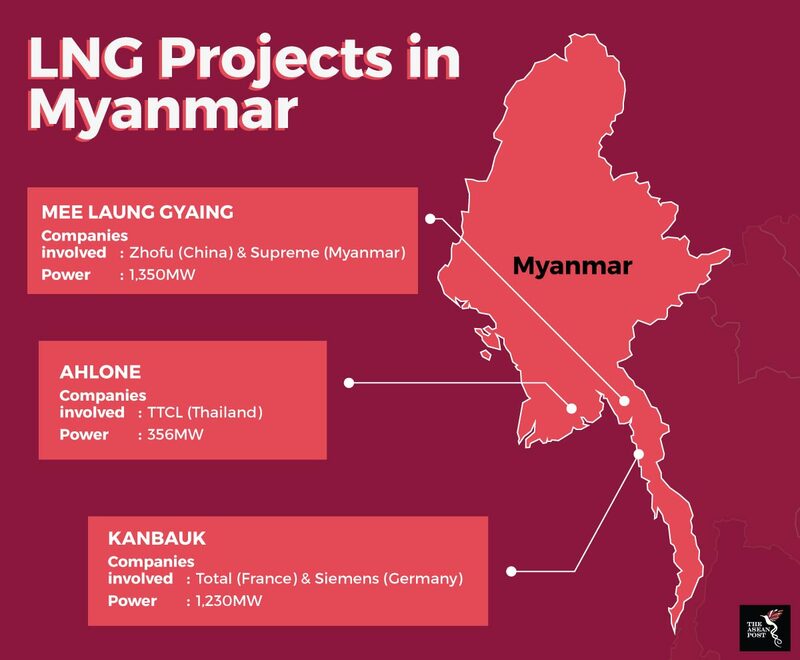 According to local reports, Myanmar is unable to produce LNG on its own since it is very expensive and requires advanced technology; so most of the investment in energy infrastructures is likely to be borne by investors. The Myanmar government has signed agreements with six companies who will be developing the plants. Siemens and France’s Total will be developing the 1,230 MW plant in Kanbauk while Chinese power plant developer Zhefu and Myanmar’s Supreme will be building a 1,390 plant in Mee Laung Gyaing. Lastly, Thailand’s TTCL will undertake a 356 MW LNG project. At the moment, hydropower is the main source for electricity generation in Myanmar, making up two-thirds of the total electricity produced in the country. According to the Masterplan on ASEAN Connectivity 2025, Myanmar’s potential hydropower capacity is 108 GW. The Myanmar government is aware of that and is already embarking on over 50 hydroelectric dam projects in the country. However, hydropower plants are slower to build as opposed to LNG plants. Aside from that, hydropower can be unreliable at times – particularly during the dry season. The problem with LNG however is the potential effect it could have on the environment. While not as damaging to the environment as coal, natural gas releases fugitive methane emissions which could contribute to deteriorating air quality around the plant area. Aside from that, LNG plants can potentially cause water pollution. Apart from environmental concerns, there are economic issues as well. Previously, Myanmar used to be an exporter of natural gas, however with depleting gas resources and the development of LNG plants, Myanmar could transition into a net importer of natural gas. Experts have pointed out that with depleting exports, the country’s source of foreign exchange is also diminishing. This combined with the imports of LNG could lead to a trade deficit in Myanmar’s economy. Furthermore, the growing Rohingya crisis in the country has also affected foreign investments in the country. Myanmar’s move towards LNG is showing that the government there is taking the initiative to meet the country’s energy demands. With increased electricity capacity, hopefully the government can distribute electricity to the one-third of their population who do not have access to electricity as yet.